K - Learn the meaning of the financial term. 1.) 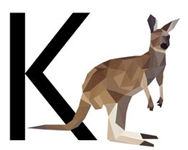 Kangaroos is a nickname for Australian shares, especially the ones included in the All-Ordinaries Index. 2.) Kangaroo bonds is a nickname for AUD-denominated bonds issued for the Australian market by non-Australian firms. Also known as Matilda bonds. When securities are traded outside official market hours, they are traded “on the kerb market”. The term conjures up an image of such trades taking place on the kerb (British English) or curb (North American English) outside an exchange. A killer bee is an individual or firm that employs defensive strategies to help another company fight a hostile takeover attempt. It is not the same thing as a white knight – a white knight will actively enter the bidding war. Killer bees is one of several anti-takeover measures (shark repellents) employed by companies. This is a latent option contract that will only begin to function (“knock-in”) as a normal option if a certain price level is reached for the underlying. This is an option that will be nullified (knocked out) if the underlying reaches a certain level. Example: This option to buy 100 shares in AT&T will be knocked out (expire and become worthless) if the share price of AT&T exceeds 50 USD. Since a knock-out option limits the profit potential for the buyer, you can expect it to have a lower purchase price (premium) that an ordinary option to buy 100 shares in AT&T. Knock-out options are usually commodity options or currency options. They are considered exotic options. An economic system where production and consumption is largely based on intellectual capital can be referred to as a knowledge economy. In a knowledge economy, it is normal for intangible assets (such as knowledgeable employees) to make up a significant part of a company’s value. Despite this, generally accepted accounting principles in the jurisdiction may not allow companies to include such intangible assets on the company’s balance sheet. Most countries around the world have an economy that includes several categories of economic activity, including agricultural, manufacturing and services. Generally speaking, well-developed first-world countries tend to have a strong emphasis on service-based economy, including knowledge economy. Nikolai D. Kondratieff (1892 – 1938) was a Russian economist active in the Soviet Union. He proposed the theory that Western capitalist economies have long term (approximately 50 – 60 year long) cycles of high-growth followed by low-growth. These cycles are called Kondratieff waves after him. Kondratieff focused especially on European agricultural commodity prices and copper prices when formulating his theory. The Korea Investment Corporation (KIC) is a government-owned investment organization that manages the sovereign wealth fund for the Government of South Korea. The purpose of KIC is to preserve and enhance the long-term purchasing power of South Korea’s sovereign wealth by managing Korea’s public funds. KIC was established by law in 2005 and received a combined deposit of $20 billion. By late 2013, KIC had nearly $65 billion in assets under management. In the United States, KSOP is a qualified retirement plan that combines an employee’s stock ownership plan (ESOP) with a 401(k). The employer will match employee contributions with stock rather than cash. In statistics, kurtosis is a measure of the “tailedness” of the probability distribution of a real-valued random variable. The kurtosis of any univariate normal distribution is 3. In distributions where the kurtosis is less than 3, the distribution produces fewer and less extreme outliers than does the normal distribution. It is said to be platykurtic. The opposite is leptokurtic, where the kurtosis is greater than 3.